South Africa’s reputation as a top performer and trend-setter in the global gardening industry was recently confirmed when the International Garden Centre Association (IGCA) appointed a South African as its president, for the first time. Nick Stodel, managing director of the well-known gardening retail group Stodels Garden Centres, has become the first person from Africa and the southern hemisphere to be selected as president of the organisation. “In the past, the international garden centre industry never looked to the southern hemisphere for inspiration, but this is changing fast,” Stodel says, adding that the appointment will put South Africa on the map of leading countries in the garden retail business. The IGCA provides a forum for garden retailers worldwide to exchange ideas and information about the industry. “There have been South African board members before, but not a president. The IGCA seems to have kept it to Europe and North America before me,” he says. Before Stodel joined the IGCA board as vice president, mostly older people who had retired from their businesses served on the board. “IGCA felt they needed younger generations to help grow the organisation. I was brought in to help with that,” he says. Internationally, the garden industry is dominated by countries such as Germany and the UK, partly due to their long history in the sector. These countries are considered to have some of the best garden centres in the world, but Stodel says South Africa is fast becoming a major player. 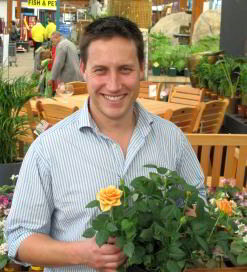 “Our garden centres are considered some of best in the world,” he says. The South African garden centre industry is still small and because it is a specialised business that trades in perishable goods, it is susceptible to changes in the economic climate. Plants are considered a luxury purchase and when economic times are tough, consumers tend to cut back their spending on garden-related items. However, Stodel says revenues are increasing. “People will cut back on buying from garden centres in tough financial times, but people still want beauty around them. Gardens are seen as an extension of the living room,” he says. He says that the country’s gardening culture has changed significantly, as more South Africans, particularly younger people, are becoming interested in gardening. “Gardening is open to a much bigger market now and I think this is partly as a result of a better distribution of wealth in the country,” Stodel says. He has also noticed that the “grow your own concept” has great appeal with younger people who are interested in being self-sustainable by planting their own herbs and vegetables. Each year more people move into urban centres and this has sparked a growing trend among city dwellers to beautify their surroundings. “In major centres such as Johannesburg, there is a great need for people to create their own beauty,” he says. Stodel says that South Africa’s gardens are comparable to the best in the world. “We have our own brand of amazing gardens here,” he says. South Africans are also spoilt for choice when it comes to plant varieties. “Other countries don’t have this. We are privileged to have such a big selection of indigenous plants,” he says. Next articleCan heritage, development coexist?